“It is not going to be easy. This is going to be an uphill battle as we are faced with a difficult task," the Home Minister told a press conference after a meeting with Bersatu and community leaders ahead of the by-election set for March 2. By right the by-election should be easy for Pakatan as it won by a huge 8,964 votes majority in GE14 less than a year ago. It should be noted that the incumbent almost always wins in a by-election. I think we should look closer at Semenyih and see whether Muhyiddin or Azmin is right. Malay 67.71%; Chinese 16.69%; Indian 13.73%; B/P Sabah 0.32%; B/P Sarawak 0.23%; Orang Asli (Pen. Msia) 0.54%; Others 0.77%. BN had held the seat all these years even when Pakatan started to rule Selangor in 2008. It only lost there for the first time in GE14 last year. Basically, it's a Malay majority constituency which used to be an Umno stronghold in Selangor. Therefore, I think the big question of whether the bulk of Malay voters have turned around again to now support BN will be answered in Semenyih. The BN's victory in Cameron Highlands by-election gave a glimpse of that, but some may argue that it may not be so accurate because BN had fielded an Orang Asli candidate which swung around the community's significant number totally in its favour. So, Semenyih will be a more percise barometer for the Malay votes. Considering the Malay voters factor, I think the outcome of this by-election will be more crucial than Cameron Highlands as Pakatan, especially Pribumi Bersatu which will be fielding its candidate could not afford to lose it. If it does so, then it's confirmed that Pakatan is sliding further down and set to lose more support among the Malays. A more extreme analysis may even conclude that such an outcome points to Pakatan not even be able to survive till the next general election. I also think that this is going to be a fight for survival for Pribumi Bersatu which is trying to replace Umno as the main party for the Malays. If it fails to defend the Malay-majority Semenyih, then it will lose a lot of credibility and may not be able to hold Pakatan together as it does now. But then again, the over 8,000 majority it won there in GE14 less than a year ago should be a good enough cushion for Pribumi Bersatu and Pakatan to win the by-election. It could also be safely said that Pakatan already have the over 30 per cent votes of Chinese and Indians in the bag. On top of those, I'm also quite sure Pakatan will go all out to defend the seat, and use whatever means to win. Well, for one thing it did use government assets to campaign in Cameron Highland and therefore I think they may do the same again in Semenyih. I'm also quite sure that Pakatan will try to exploit Najib's trials which start this week to remind people, especially Malays in Semenyih that BN, or to be more precise Umno is bad. BN will find things to be tougher this time as they don't have much resources after the post-GE14 crackdown where its accounts were frozen. No matter how one's to put it, the odds are still not in their favour. Nonetheless, I think it still boils down to just how the BN's leadership approach the by-election. If Mat Hassan and the gang remain as smart as they were in Cameron Highlands, then they may spring another surprise and completely turn the tide around. A right candidate and smart campaign strategy may do the trick again, I think. Then of course, there's the cooperation with Pas which worked beautifully in Cameron Highlands. It should be noted that the Pakatan's 8,964 majority in GE14 for Semenyih would have been much reduced if votes won by BN and Pas were combined. BN had received 14,484 votes and Pas (6,966) as compared to Pakatan's 23,428. Then there's also the fact that Pakatan has became arrogant and screwed up on so many fronts since winning GE14. 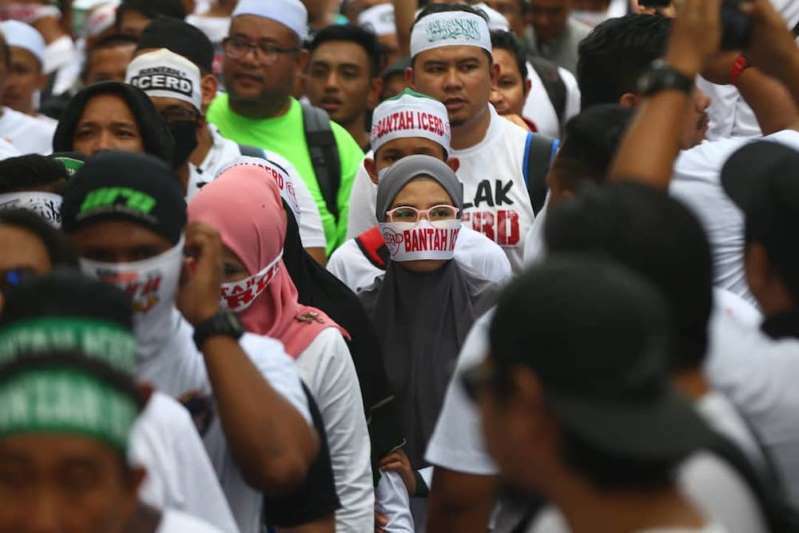 There's no doubt that many Malays are getting disillusioned with Pakatan, especially over its handling of issues such as ICERD and the tragic death of fireman Adib. And of course there are those Pakatan's broken promises and the failure to improve things, especially for the Malays after winning GE14. Those may help BN a lot in this coming by-election just as they did in Cameron Highlands. Personally, I think Azmin was not wrong to feel confident about Pakatan winning in Semenyih because it's after all the incumbent with a huge majority cushion. However, Muhyiddin, being the former Umno deputy president should know the Malays' sentiment better and that the danger of Pakatan losing to BN in a Malay majority constituency such as Semenyih is currently very real. I'm with Muhyiddin on this one. Pakatan thought the increasing popularity of Najib in social media would die down once his multiple court cases commence. Wrong! He will be even more popular once he begins frequenting the court complexes for his court cases. With all the media attention will be directed at him in due time, the sympathy towards him will grow even more together with his popularity. The Malays are sympathy prone. They are willing to turn a blind eye to his past sins if they feel Najib is being hard done by. They will look at him as victim of Pakatan politics. Like Anwar black eye episode back in 1998. Mohon check setipiket kelulusan calun2. Klo tak kisah PGU15 saya penjual nasi lemak pun teringin juga nak bertanding, mana tau dapat ada bakat jadi PM Malaysia. Mohon calun2 buat medical checkup, doktor sah sihat baru kasi bertanding.. dak tak laghat asyik adakan prk aje dalam 9bulan ni. mohon check dia lulus ke? bapak er kalau tak salah "atok" dia yang ade banyak harta karun, atau syar genting kasi belajar luar negeri, in dia bikin. only about 17 to 25% malai supported PAKATAN during PRU14!!!! !and only 10 to 15% during PRU13!!!!! 1.Extended MRT line from Kajang to Semenyih. 2.Hospital in Semenyih.Current Kajang Hospital old like the 70's. 3.Bypass Highway from LEKAS to PlUS North South. 4.Flyover infront of Maajid Semenyih to minimize jam road. 6.Primary school at Ecohill.Cuŕrent SK Bandar Rinching càn't cater the booming population. 7.Multipurpose Hall. Dewan sekarang besar ciput..
8.4 lane road from Bangi to Semenyih via UkM. 10.Alternative Highwày from Southern Selangor to East Coast. Bolehkah mana-màna calon atau Parti mereliasasikan permintaan kàmi. Kalau 50% daripada yang diatas ditunaikan is good enough. "17 to 25% malai" fake news.. hangpa cakap tulis ape semua org dah tak percaya..pakai main bohong tembak memanjang. Prk Semenyih ni tolong2 doakn Guan Eng beri RM12juta kat sek Agama bole tak? Hantaq anak cucu pi bljq sana dulu baru la kamu kah! kah! Seeing is believing.. takyah sekadar dengaq cerita dan baca article aje. Takde ape yg sepesial pun sklh cina. Kena tenyeh 24/7 menghafal chinese charactors tu pun 6 thn klo cekap 1000 perkataan?. Menghafal memanjang. Cikgu call makayah nak lotan murid! Kat rumah pun makayah tibai dengan rotan klo kerja sekolah tak siap. Dah dewasa kerja nak lotan semua olang. Pi kelas tiusyen 24/7 dok bayaq beribu2 hafal soalan2 ramalan. Dah besaq berniaga barang2 tiruan ciplak hasil kerja olang lain. Idea creativity sendili talak. Pemimpin2 sklah macam DongZong.. riuh kena expose gunapakai fake setipikets. Kerja kat kepong pun bole dapat triple degree, graduation bergambaq kat Australia. Tapi cakap BI satu ayat pun taktau. Semua olang lia olang cakap boloh pasai meleka yang boloh. Pemimpin rakyat dpt quality macam dalam PH. Terpaksa teliang tunjuk bzzz godek2 pasaran saham, GLC, Petronas, Tabung Haji, Felda dn tabung2 amanah yang lain. 9 bulan projek sendili apa pun talak masuk ilham sendili boh liao. Agak2 RM12m sumbang kat sklh swasta cina tu depa cekop duit dari mana? "Last December, Lim announced allocations of RM2 million each to the Southern University College in Skudai, the New Era University College in Kajang, and Han Chiang University College of Communication in George Town. As Lufti pointed out, Umno and PAS chose to not mention the Finance Ministry approving an RM15 million allocation for Universiti Islam Malaysia (UIM), also a nonprofit institution, as well as RM25 million for registered sekolah pondok." "In responding to similar criticisms last month, Lim pointed out that a total of 35,364 sekolah pondok and Sekolah Menengah Agama Rakyat students would receive the equivalent of RM707 each in aid. “As for the Chinese private secondary schools, of which there are 62 with an enrolment of 84,462, each student will benefit to the tune of RM142,” the minister said." Haiyaa.. mana ada dlm perlembagaan bantuan kpd sekolah bangsa2 asing private schools?? Ini bukan zaman British oooi..
Esok buka sekolah Bangla pun akan dapat peruntukan juga ke? Kan dah ramai Bangla dok sini?? Mana ada dalam perlembagaan hanya bagi bantuan kepada sekolah bangsa Melayu and jangan bagi sekolah kapiak. Kalau Bangla jadi warganegara, satu hari nanti ini akan berlaku juga. Kenapa tak boleh ke Bangla minta bantuan. Sekarang pun dah ada sekolah untuk Rohingya, apa pula Bangla tak boleh. Ini tak adil lah Prof. The fake degree issue is a major blow to PH especially to Bersatu itself.The issue manage to drown an attempt by PH supporters to attack Pas using RM90 million donation issue. In fact the fake degree issue have pushed many more PH politicians to come forward in public about their lack of academic credentials.Malu apa waklu. The late Ronald Reagan was not a college graduate, and yet he led USA as a President for 2 terms (8 years) and had a successful presidency. My point is a politician may have lack academic credentials as long as he can lead the masses with integrity and honesty. Politicians from both sides who faked their academic credentials should be barred from leadership roles.